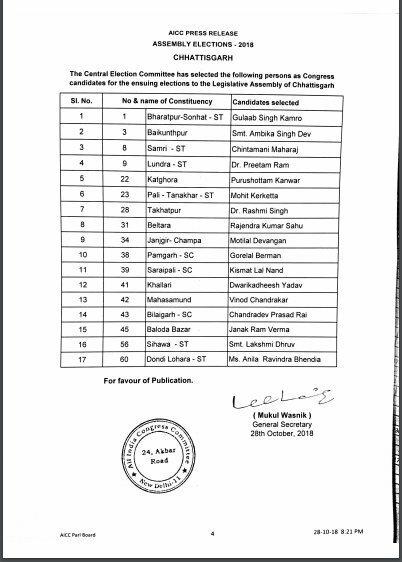 The Congress party on Sunday released a list of candidates for 17 seats for the upcoming assembly elections in Chhattisgarh. Earlier this week, the grand-old party released a list of 37 candidates for the second phase of polling. The Congress is seeking to oust the BJP, which has been governing the state since 2003, from power this time. Assembly elections in the state will be held in two phases. A total of 18 assembly seats in the Naxalism-hit areas will go to polls in the first phase of polling on November 12. The second phase of polling for the remaining seats 72 will be held on November 20 and results will be out on December 11. 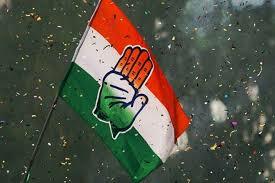 The Congress, on October 18 and 22 had announced the candidates for the first phase polling in two lists. In the first phase polling, the Congress has fielded former prime minister Atal Bihari Vajpayee's niece Karuna Shukla from Rajnandgaon Assembly constituency against Chief Minister Raman Singh.